I don’t know what it’s like to be an orphan. But I do understand what it’s like to miss a child. As a divorced mother of two, I spend much more time than I’d like without my children. And when they’re away from me, with their father, I cannot settle to anything, to anything at all. Enforced absence from your children should come with a health warning. It has the intensity of physical pain. Something vital is missing, a limb, an internal organ, half your heart has been clawed out. And if you’re away from them for too long, you begin to lose your mind. You dissolve; you might not be real. I was given John Brownlow’s pencil as my object. Silver, ornate, still in its case it symbolised the connection between the hospital and their mothers. He was known as a compassionate man who communicated with the mothers of the foundlings and let them know how their children were getting along. I went along to the archives and read heartbreaking petitions by these woman asking the hospital to accept their children. You could feel the distress on the pages. Their letters were often covered in ink blots and crossings outs, these letters were not easy to write – partly because of the heartbreak in the pages, and partly because these women were not always educated. 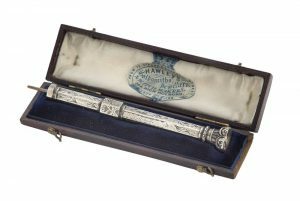 I liked the idea of him using this beautiful silver pencil to write long letters to the foundlings’ birth mothers, telling them news, making them proud, trying to help them settle with the decision they had made. I imagined the women lingering outside the gates of The Foundling Hospital, in Coram Fields trying to catch sight of their child. Brownlow understood. For he was a foundling himself. Baby 18,607. I had this sense that he made it his business to make life better for both the foundlings and their birth mothers. He would make these blank children count. At the age of 14, he became a clerk in the hospital, later working his way up the ranks to become secretary. He was part of the hospital for 72 years of his 73 year-long life. He was friends with Charles Dickens, who rented a pew next to him at The Foundling Hospital Chapel. It can’t be a coincidence that Oliver Twist’s kindly benefactor was named John Brownlow by the author. I took the title for this poem from an 1853 article written by Charles Dickens in his pamphlet, Household Words and entitled, ‘ Received, a blank child.’ It refers to the entry form at the Foundling Hospital which carries the words The <Blank> Day of <Blank> Received a <Blank>Child. Like all the best stories, there’s a mystery at the centre of John Brownlow’s life. For a man who was diligent about keeping records and as the man who would have had access to The Foundling Hospital’s own archives for a very long time, his own records are missing. No trace of his own birth mother or circumstances. We only know that he was christened in the chapel on 9th August 1800 by the Reverend Samuel Harper. So I’m hooked to this tale of the foundlings’ foundling. This foundling who worked beyond his station to mingle with famous authors and artists, who made the hospital a better place, yet who felt ashamed of his own upbringing. I’m deep in the archives now, no escape, I’m hoping to write a children’s book about this brave, brave boy who became such an important man. When he died, the governors of The Foundling Hospital commissioned a special memorial stone to commemorate his service. His widow wrote to his successor and asked for the wording to be changed so that his background as a foundling himself wasn’t made public. There was still so much shame associated with being a foundling, but John Brownlow, Baby 18,607 spent his life’s work making them count. Fevered ink, tears, blots, crossings. Pin petticoat scrap, seal notes. I will make you count.